I don't have a green thumb….just ask my mom! Nevertheless, I have planted a LOT of things over the years….and a lot of those plants have not made it! 🙁 I do love to get out in the Spring and spend time in my yard. I enjoy planting flowers and even growing some easy vegetables and love having my kids get involved. Luckily you don't need a green thumb to garden with your kids! 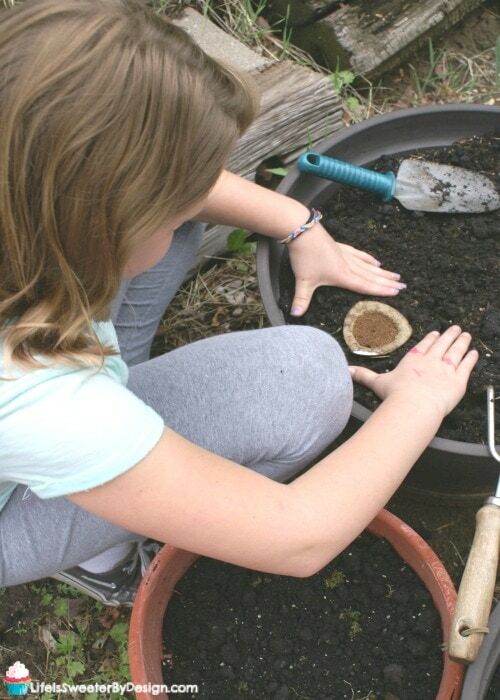 One fun way to get kids excited about gardening is to turn it into a DIY project! 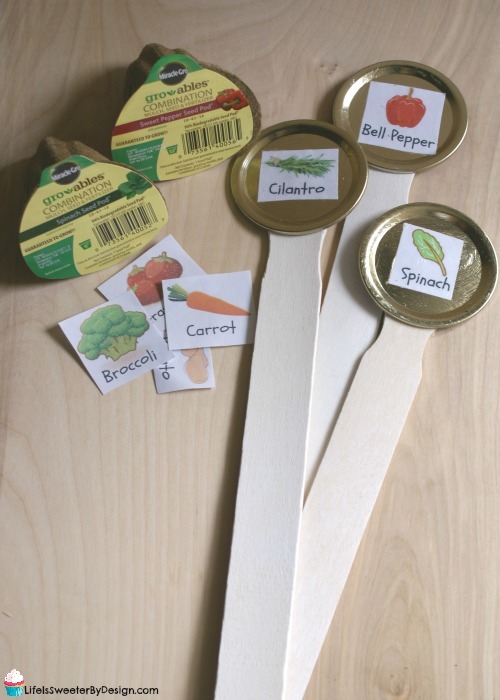 This DIY Garden Marker Stakes for Kids project is quick and easy and will help your kids keep track of the veggies they are planting! When gardening doesn't come naturally….you tend to look for products and plants that can help you succeed! Thanks to my mother's wisdom and knowledge I have been able to find some perennial plants that come back every year and make my flower beds look great. (Thanks to the Gro-ables Project for IZEA for sponsoring this post. All opinions are 100% mine.) I am really excited about a new product from Scotts Miracle-Gro called Gro-ables that is helping me find success with my vegetable container garden! I love to have my girls with me while I am outside digging and playing in the dirt. Learning to plant, weed and water is so good for kids and they typically find it fun. Watching a plant grow is fascinating and kids love to know they had a part in making it happen! The best reason I have for using Gro-ables is that they are GUARANTEED to grow! 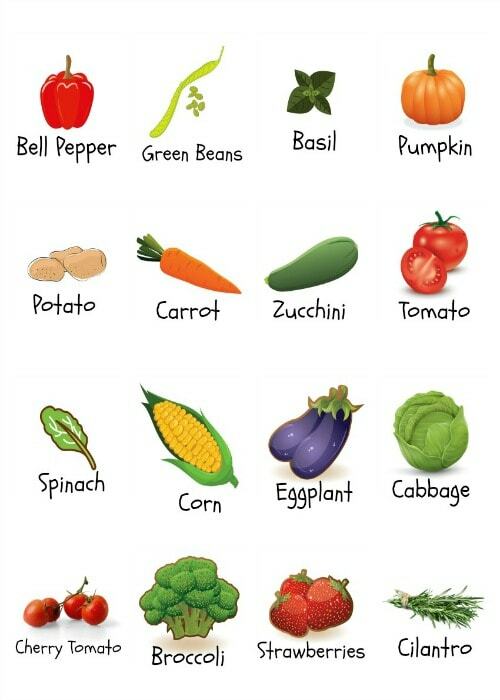 Everything I need to grow the vegetable or herb is right in the seed pod….it is a no brainer! Each pod contains the seed, growing materials, plant food and has a biodegradable shell!! All you have to do is push the seed pod into loosened potting mix until the top is level with the potting mix's surface. Water the area each day and in 1-2 weeks your seed will sprout. I also love that the Miracle-Gro started the Gro-ables Project. Their movement is to share the joy of growing herbs and veggies while giving kids truly hands-on learning experiences. This is such an easy way to get children excited about growing plants, veggies, fruit and herbs! Having your child help water the plants each day will teach they some responsibility and will also allow the child to see the progress the plant is making! 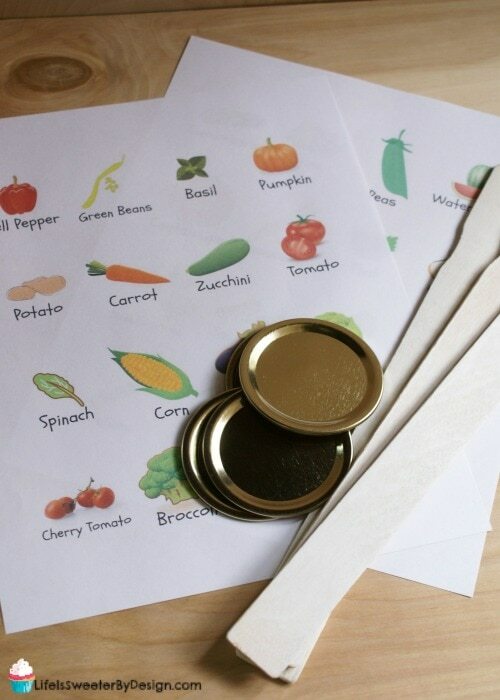 Make your Gro-ables learning experience even more fun by making some DIY Garden Marker Stakes with your kids so they can keep track of which plant is which. This is a quick project that toddlers to teens can help with. First you will paint both sides of your wooden paint sticks and let them dry. 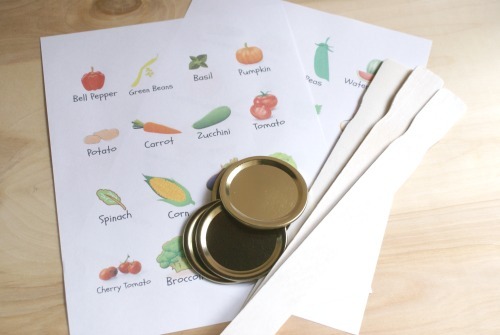 Print off your FREE PRINTABLE pictures sheets and cut out the fruits, veggies or herbs you are planting. Put a thin layer of Mod Podge Outdoor onto the back of the cut out picture and put down onto the canning lid and slide it into the place you want it to be. Allow to dry for a few minutes. I found a box of canning lids at a local big box store for less than $2. Put another thin coat of Mod Podge Outdoor on top of the picture. Finish all your picture lids and then do a 2nd coat on top to get a nice protective seal! Once the lids are dry you can put a small dab of E9000 on the back and glue it onto the top end of your paint stick. Now you just take it outside and position it in front of what you are growing! What are your favorite tips for growing plants with your children? 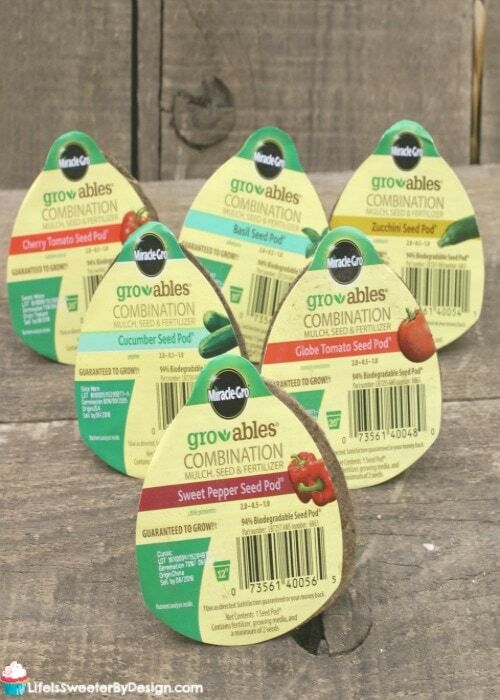 Have you tried Scotts Miracle-Gro Gro-ables? Click on the images below to get your free printables so you can make your DIY Garden Marker Stakes with your kids! You can grab more fun free printables right HERE. If you love to garden be sure to check out these great gardening articles! Those are too cute. I love how they came out. I want to make some with my kids. Wow! 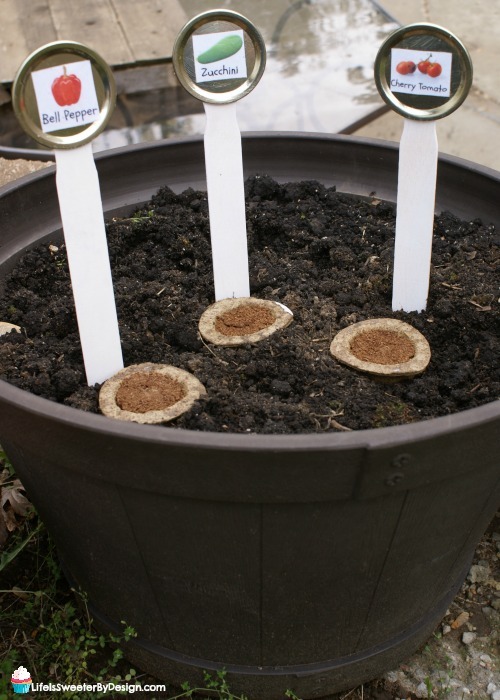 Such a wonderful idea and something fun to get the kids into this planting season! Thank you for the tips and I will be trying this out! That would be a fun idea for my son. He’s always wanting to grow stuff but we always forget to water them. Planting season is here so we need to get going. I remember doing the pea or potato experiment at school and wishing I could have a real garden. I love these growable and the fun garden markers. What fun project for kids and parents to do together! And it’s such a great hobby – something productive that you can do together! What a fun little garden project. I think my kids would have loved planting their own veggies with these stakes. This is a nice option for people who do not have much knowledge about gardening, the instructions are pretty simple and easy to follow! I love the DIY stakes, it’s perfect for parents who are teaching their kids about plants and veggies. I wouldn’t mind trying Miracle-Gro in our garden. How fun this activity that kiddos would be learn and enjoy to this project.I bet that my son would be loved planting it too. This is such a cute idea. For sure kids will enjoy gardening even more. Amazing. Fun idea! I’m sure kids would love to do this activity. It’s really important to boost their skills by doing a great activity like this. This i very smart idea! I’ve never thought this before. I want my son learn about this. This is great idea for encouraging the kids to get involved in gardening. This would make it so much fun for them. I’d like to do this with my youngest. Maybe it would encourage him to try more flavors. that’s pretty neat! My daughter would love this. Thanks for sharing! it looks so nice, i would love to do this with my mom and dad. 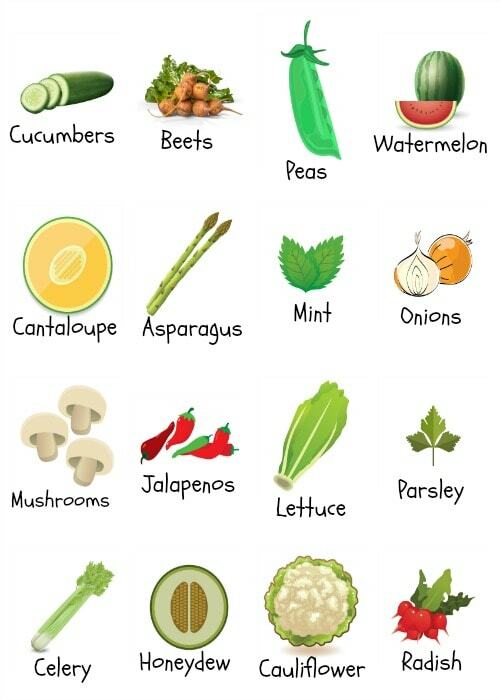 These garden labels are awesome!!!!! I really do need to get more into gardening!!! It would be so fun to plant my own food.